The 2017 season was a bit of a disappointing one for Josh VanMeter. He struggled at times in Double-A Pensacola hitting .255/.326/.352 while playing there for the entire season. 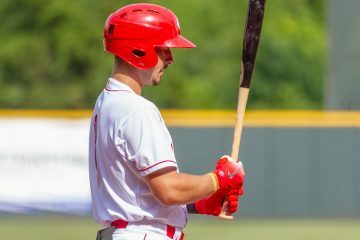 He returned to Pensacola to begin the 2018 season. Pensacola opened the season on the road in Mobile, and Josh VanMeter made his presence known rather quickly. The Blue Wahoos came home the following series, completing his first week of April hitting .318/.348/.682 with five doubles and a home run. Things didn’t slow down for the next ten days, either. He racked up 10 more hits (.385) with 10 walks (.541 OBP) in that stretch. Things did slow down over the final week as he went into a slump, hitting just .125 in seven games. 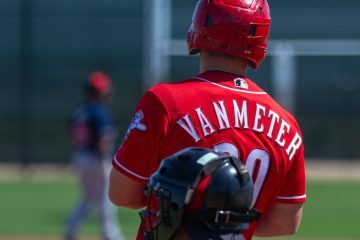 April would finish with VanMeter having played second, third, shortstop, and left field during the month. At the plate he hit .278/.404/.431 with more walks, 16, than strikeouts, 14. He also stole four bases. The first seven games of May went fairly well for Josh VanMeter. He went 7-23 (.304) with seven walks and two doubles. That was be the last time on the season that he would see Double-A pitching. 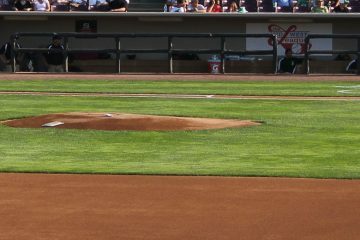 He was promoted to Triple-A and joined the Louisville Bats on the 9th. Hits didn’t come easy in the first five games he played – he went 1-9 in that span, drawing six walks. The next ten days went quite well for VanMeter as he went 12-35 (.343) with four doubles and two home runs. He did slump to finish the month, going 2-20 in the final five games. May was a hot-and-cold month. Overall he hit .253/.350/.391 with 13 walks and 17 strikeouts in 100 trips to the plate. 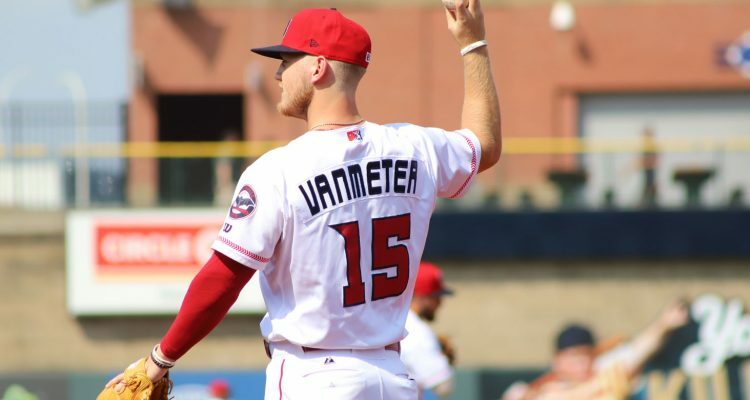 The slump that ended May continued into June for Josh VanMeter. He played in nine games over the first 15 days, going just 3-28 (.107) without a walk or an extra-base hit. The second half of the month did go better, but only to a point. His power showed up, as he had seven extra-base hits in 13 games. But he only hit .235 and drew just two walks (.264 OBP) in that stretch. Over the 22 games in June he hit just .190/.210/.354 with just two walks and with 24 strikeouts. Things didn’t get better in the first week of July for Josh VanMeter. He went 2-16 (.125) with a double and three walks. The next ten games did see him catch fire, though. He went 12-37 (.324) with five extra-base hits (.595 SLG). It didn’t last, though. In the final eight games of the month he went into another big slump, racking up just three hits in 23 at-bats. While it was an improvement on June, he hit just .224/.286/.382 in July with seven walks and 17 strikeouts over 84 plate appearances. August didn’t start out great, either, for Josh VanMeter. He had three doubles in the first week, and four walks, but he also only had four hits – going 4-18 (.222). Things picked up from there in a big way. The 23-year-old went on an absolute tear over the next three-and-a-half weeks. In 25 games he went 33-95 (.347) with 11 doubles, 3 triples, and 5 home runs to close out the season on a high note. Over the final month of play he hit .327/.394/.637 with 13 walks and 20 strikeouts in 127 plate appearances. Hitting | Josh VanMeter can use the whole field, but he’s struggled to hit for an average throughout his career. He’s got a below-average hit tool. Power | Despite his size he’s got fringe-average future power. Speed | He has fringe-average speed, but he uses his speed well. Defense | He’s very versatile, having played five positions in 2018. He doesn’t really stand out anywhere, but second base is his best spot on the field. Arm | He has a fringe-average arm that plays fine at second base, but can be a little stretched at some other spots he plays. Josh VanMeter profiles as a potential future utility man. He doesn’t look like he can start anywhere on the field, but he’s got the ability to play enough defense around the field with the exception of center field and catcher. Nothing really stands out in his game from a tools perspective. But he is good enough in most categories to play all around as a backup. At the plate he’s got a solid approach. He draws walks and he makes enough contact. And in 2018 his power started to show up a little bit more. He struggled to hit lefties in 2018, but he hit very well against righties. His OPS against right-handers was .859, but against lefties it was just .581 during the season. Just about everything in his profile just looks like that of a utility man. 415 Feet on August 24th. At home he hit .230/.299/.380 in 2018. He hit .286/.369/.520 on the road in 2018. In some regards I’m surprised by how little attention he gets. Checks all the boxes statistically for me. Would be considered a nice bench piece if there weren’t already quite a crowd to consider. Hope he gets a shot in Cincinnati. Not at all about this article, but what do you think about the Reds taking Zobrist and a prospect off the Cubs hands so they can get under the payroll tax threshold they just went over. Versatile defender and was a 3+ WAR two of the last three seasons. I’m not actually sure what I think about it but he seems like he’d be available. I think Senzel takes that Zobrist role, so no need to add him at this point. A weird thought I had was to take Heyward off their hands if they pay down his salary to $5 or $6 million per year (maybe they take Kemp as part of it). He is still only 29 and could be the CF this year and at worst a bench guy down the line. I’m having a hard time talking myself into that one, though. Justin, I would say no as Zobrist best positions are LF, RF and 2B where we’ll be trying to get at bats for Winker, Kemp, Puig, Gennett and Senzel. The way our roster is shaping up, I’m just not seeing the value. If the Reds want to add a bench piece for the future, I would prefer Marwin Gonzalez. He’s not as good of a hitter as Zobrist, but he is age 29 vs. 37, more versatile defensively, and is predicted to cost less. What I would really like to see as a next move is for the Reds to bring in a blocked CF prospect from another organization that could use one of our young pitchers. Dalton Pompey is blocked in Toronto and out of options (maybe Wisler in return) and Dustin Fowler in Oakland (maybe Romano as a return). Both are former Top 100 prospects that don’t have a clear path to their teams major league rosters. Had the opportunity to sit with VanMeter’s grandfather, from Indiana, at a minor league Spring Training game a few years ago when he was still with Padres. Typical grandpa so learned very little unbiased information but it was a fun conversation. Few good players have come out of Norwell HS in Ossian, IN. Hope you get a taste of the show Josh! Then comeback to the Markle pond and share your story. 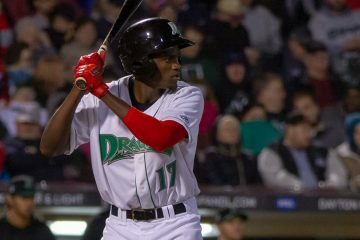 Congrats to Taylor Trammell for making #6 outfielder on mlb.com’s preseason list! Both Trammell and Senzel should be in mlb.com’s top 20 based on their overall FV scores. That’s a nice showing for the Reds.